The road North of Kaikoura has absolutely fantastic views both inland of rolling hills and on the other side of the rocky coastline of the Pacific Ocean. The sea is a fantastic bluey/greeny colour. 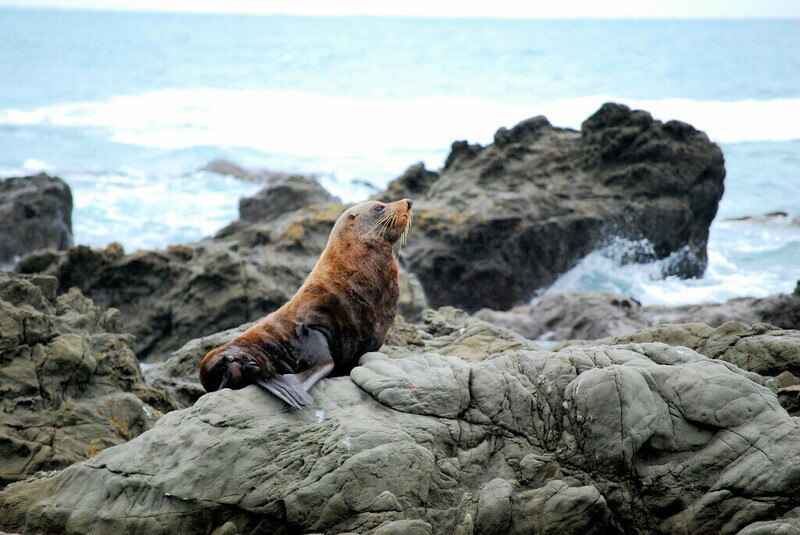 Within 15 minutes, we stopped at the Ohau seal colony and there were at least 150 seals on the rocks and beach just below our cliff top viewing point. I promise that I am under-estimating not exaggerating. They were totally awesome. The pups, born in November/December, were playing in a big rock pool or playing chase or getting scolded by their mums. The older seals were mainly stretched out sleeping on the rocks although some of the big bull seals were throwing their weight around and there some squabbles going on. I was fascinated, they were just awesome to watch. I stayed so long that Paul got quite cold and had to return to the car to warm up. We took literally hundreds of photos and video but also we just enjoyed standing watching them. Just a reminder that some of Paul’s photos are here: Our New Zealand photos. We also walked up to the Ohau stream and waterfall where the mum seals sometimes send their pups to play while they go out to sea to feed. There were only four seals there today but they were very cute and the waterfall was majestic. We hadn’t really intended to stop for long but in the end we spent the whole morning watching the seals and even then I wanted to go back and see the seals all over again. We didn’t get to Blenheim until 4pm-ish. The inland scenery and the Pacific coast line on that road is just fantastic. I wouldn’t be at all surprised if it has been nominated as one of the best coast roads in the world. We entered Marlborough wine region and the number of vineyards and huge wineries increased dramatically. I recognised so many names of wines that we drink regularly at home. By the time we got to Blenheim the royal visitors were long gone and it was raining quite heavily. So we pressed on through Picton along Queen Charlotte Drive, which twists and turns its way along the coast. You get panoramic views across Picton harbour and then the bay. Once again I was caught out by how tropical the vegetation is, with huge ferns growing tall. We ended our day in a hot tub on the veranda of our guest house with panoramic views of Queen Charlotte bay, before guzzling local wine and having a home cooked meal. A memorable end to a fantastic day. Today probably gets my vote for the best day so far… And it has stiff competition for that title. It also had the potential to be really naff but it definitely wasn’t. The whale watching team were really professional. We really needed their expertise but also they made the trip so much more interesting. They really care about their animals and environment and are really passionate about what they do. 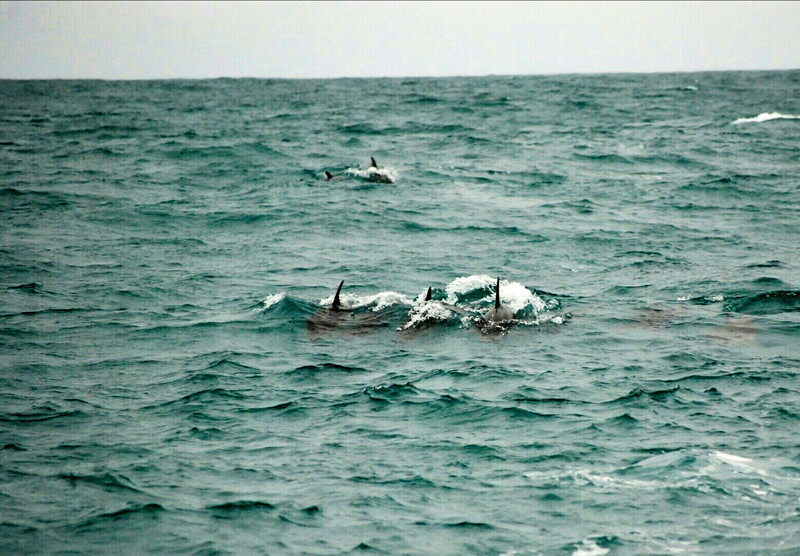 Kaikoura is one of the few places in the world where the continental shelf is very narrow, because of a huge ocean canyon, and the really deep water (over 1,000 metres), is close to land. So deep water creatures can come much closer to the shore than usual. 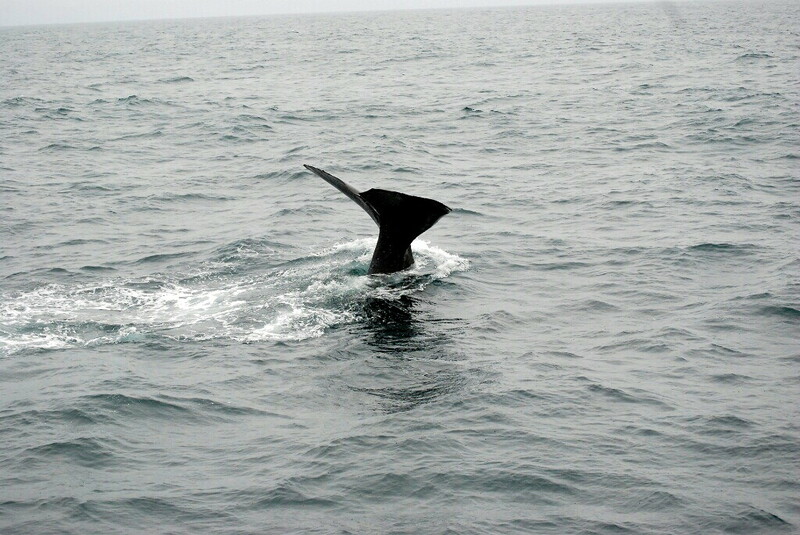 At the moment, there is only one male sperm whale in the bay who constantly dives for food (often giant squid) for between 40 minutes and an hour then surfaces for about 10 minutes to re-oxygenate. 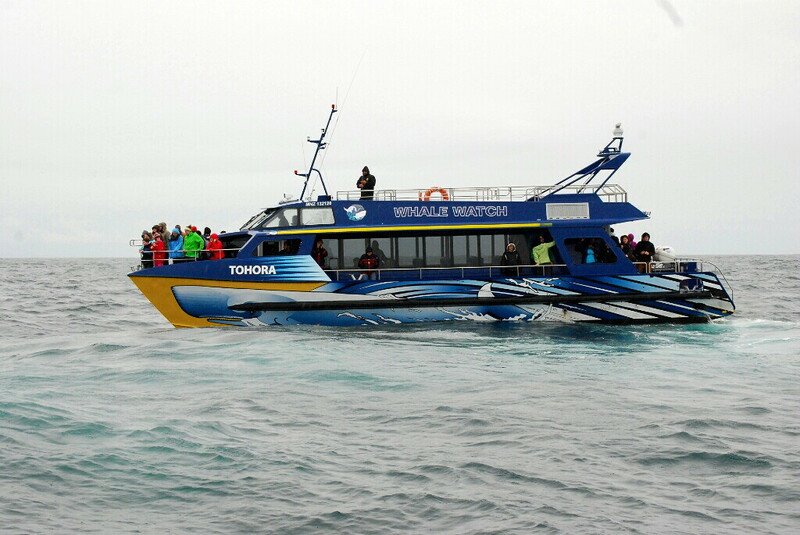 The skill of the crew is to spot where the whale has surfaced in the huge bay and get the boat there within a minute or so, so everyone can see the whale and especially see him dive back down. Why is it one of my best highlights? The boat was great fun, we skimmed over the waves at 30 knots. The commentator was so enthusiastic and so knowledgable. 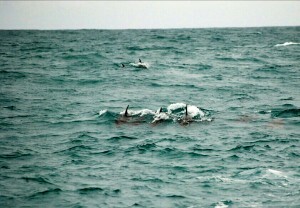 We saw literally 50+ dolphins playing in the water doing back flips and just messing around. But I will never forget the awesomeness of being right alongside, almost within touching distance, the hugest, most powerful whale – they can swallow a shark whole – and watching him dive. It was truly awesome for me. Altogether a much better day, although the weather was only marginally better. Canterbury Museum in Christchurch – wow what a fab museum. Really interesting, all sorts of exhibits – geology, earthquakes, Maori culture, Antarctic exploration, NZ animals and birds and loads, loads more. No entrance fee but a donation at the end, we were happy to donate generously. 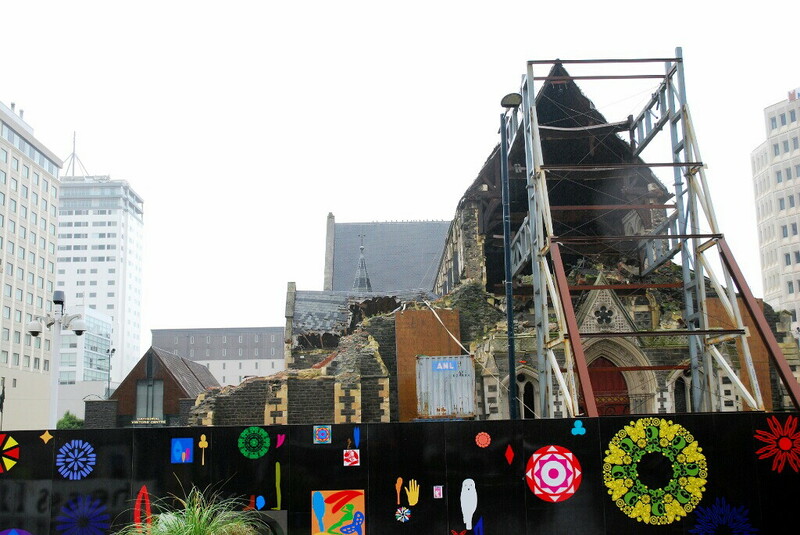 Then a walk around the centre of Christchurch, so interesting but also very sad. There are some new projects but you get the feeling the scale of the repair work needed is just overwhelming. I loved the old trams that are still running. Then another really fab museum. Two of the best museums in one day. 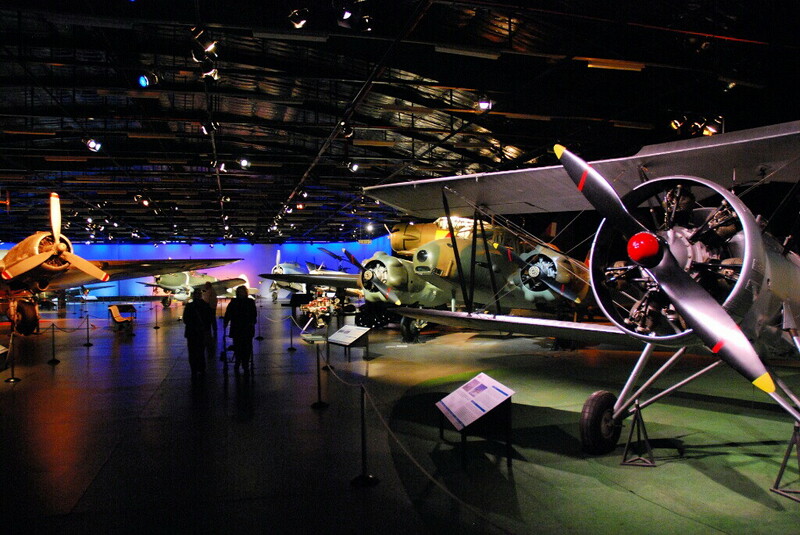 The National Aircraft museum in Wigram. Very well done, really interesting. In a land of lovely, friendly people, the restaurant manager gets my vote for the nicest, friendliest person who we’ve met so far and there is stiff competition for this accolade. On balance I am glad that we came to Christchurch, it was fab to meet Greg and visit the two museums. But the city sadly is unsettling and proof that it can take a community a very long time to even begin to recover from a natural disaster and the repair work can be haphazard, chaotic and unevenly distributed. Well a few changes . . . For starters, it’s been very wet with steady rain for two days; the drive from Mount Cook was longer than I expected and we definitely went from mountains and lakes to fertile farming plains; we also went from sheep to dairy/beef farming; also from stunning touristy beauty spots to a big city. the sadness of the locals that things aren’t getting repaired more quickly. Also I didn’t expect our B&B to be a Buddhist house of sound and calm. Not a bad thing, just a surprise! Monday was a tiring day but a lovely ending when after months of e-mail chat we met up with Greg in person and had a very relaxed meal together. We saw a lot less of “Mount Cook” itself than we were expecting. It was always “just round the next corner”. But the neighbouring mountains more than made up for that. Also all the mountain tops were covered by strands of mist but again they are so impressive it didn’t detract from their awesomeness. Mount Cook village is sort of like a posh base camp, about 75% tourists and 25% climbers. The Old Mountaineers cafe was closed by 8.30am for breakfast, the serious climbers and walkers long gone. But we walked for about two hours with stunning views of the Mueller glacier along the whole route. Shockingly 100 years ago the Mueller glacier filled the whole valley were we were walking but has now retreated to the mountain side. It definitely brought it home to me how much the glaciers are shrinking. Glaciers are really noisy! We heard constant groans, creaks and rumbling like distant thunder. They are beautiful as well especially when the sun catches them – shimmering white with blue and green steaks, although they often have a layer of gravel on top. Paul has the confidence of a mountain goat, I do not! Paul scrambled up the terminal moraine to view the Tasman lake and glacier (main photo). 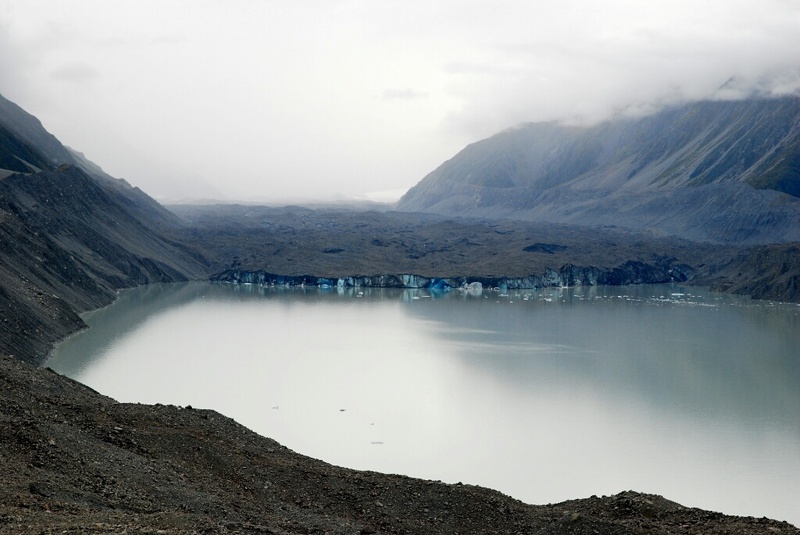 Again the glacier has retreated to the far end of the lake but it is (was ?) the largest glacier in the Park. Whilst driving round Lake Pukaki, a proper wild cat with bushy, stripy tail, ran across the road. And then to emphasise the difference, two of the thinnest feral cats I have ever seen. Generally we are also seeing lots of hunting birds with huge wingspans, Harrier Hawks we think? . We have stayed in a very comfy bach, (batch) at the bottom of Lake Tekapo. Onto Christchurch today – Monday 7th April. Sadly it was too cloudy last night for star gazing but we are going to drive up to the observatory this morning just to see the views of the Lake.